Five people were killed in the disorder in Harlem, four black men and one white man. Two of the black men were killed by police. The circumstances in which the others were killed were not clear. All suffered their injuries in the vicinity of 125th Street. 1. Lyman Quarterman, black, thirty-four-years-old, shot in a crowd. At around 10.30 PM, Quarterman was part of a crowd at 121st Street and 7th Avenue that police were struggling to disperse when he was shot in the abdomen. It is clear from the newspaper reports that police fired their guns as part of their efforts to disperse the crowd, raising the possibility that an officer shot Quarterman. White press reports discounted that possibility in various ways. 2. Andrew Lyons, black, thirty-seven-years-old, suffered internal injuries suffered in a crowd. Lyons was injured “during the thick of a melee at 125th St and 7th Avenue,” according to a report in the Amsterdam News. Reports in nine other newspapers note that he died of “internal injuries” but either simply say he sustained his injuries during the disorder or offer no other details. Unlike the other men killed in the riot, Lyons does not appear in any of the hospital or ambulance records. 3. August Miller, white, fifty-six-years-old, suffered a head injury in the midst of a crowd . Around midnight, Miller was part of a crowd at 126th Street and Lenox Avenue when he was injured. A cab driver took him to the Joint Disease Hospital, according to the police complaint report, where doctors diagnosed him as suffering a possible skull fracture. White newspaper reports attributed his injuries to “rioters,” with Herald Tribune, New York Journal and CT directly stating that he had been beaten by rioters, while Brooklyn Daily Eagle, New York Post and New York Times offered more oblique statements that he had sustained his injuries while in the midst of the crowd. Miller himself never described the circumstances of his injury, dying on March 22 having never regained consciousness. Police could find no witnesses to establish the circumstances in which he was injured. His employers did report Miller had been “acting peculiar for some months previous.” An autopsy performed at the City Morgue determined the cause of death was a cerebral hemorrhage, “a natural cause, nothing suspicious.” That finding was not reported in the press. 4. Lloyd Hobbs, black, sixteen-years old, shot by Officer John McInerey. The officer alleged that Hobbs had been looting an auto parts store on 7th Avenue, and failed to stop when he called out to him to halt. Hobbs had been part of a crowd in front of the store, but witnesses at the scene denied that he had broken the store window or stolen anything from it. Hobbs did not die until March 31, so he does not feature in the initial press reports of those killed during the riot. Subsequent efforts to prosecute the officer and evidence presented to the Mayor’s Commission on Conditions in Harlem led the Commission to feature his killing in its report on the riot. READ MORE about the shooting & efforts to prosecute McInerey. 5. James Thompson, black, nineteen-years old, shot by Officers Campo and Beckler. The officers alleged that they interrupted Thompson looting a damaged grocery store on 8th Avenue across the street from his home. Press reports offered a variety of different accounts of what happened next. The American, Home News, Herald Tribune, and New York Post reported a gun battle between the officers and Thompson, during which he was shot in the chest and Officer Campo in the hand. The World Telegraph reported Thompson and Campo struggling, during which Thompson was shot, after which the officer dropped his gun, causing it to go off and a bullet to hit his fingers. The Amsterdam News reported the officer’s gun went off accidentally, hitting Thompson. The arrest report makes no mention of Thompson having a gun or struggling with the officers, merely colliding with Campo as he tried to flee the building, causing Campo’s gun to go off and injure his fingers. As Thompson fled both officers fired at him, apparently hitting him as he stumbled down the street. Their shots also struck two white men on the opposite side of the street, injuring one in the leg. A file in the MCCH records indicates that police investigated the shooting after the riot. Although the World Telegraph story reported Thompson as saying at the hospital that “he was hungry, “that others were stealing, anyway,” and that he was long out of work,” there is no record of an admission to police. There is an interview with Thompson’s aunt. She reported hearing from Thompson’s landlady that he had brought home canned goods during the riot, with the implication that he had been looting prior to the shooting. However, she also reported that he worked at a barber’s shop, in contradiction of the admission reported in the World Telegraph. 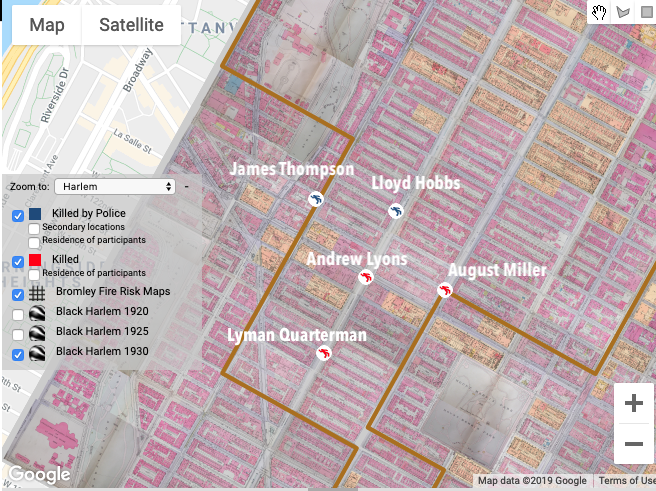 There is no record of police taking any action against the officers or of Thompson’s shooting attracting attention during the Mayor’s Commission on Conditions in Harlem hearings, as that of Hobbs did.